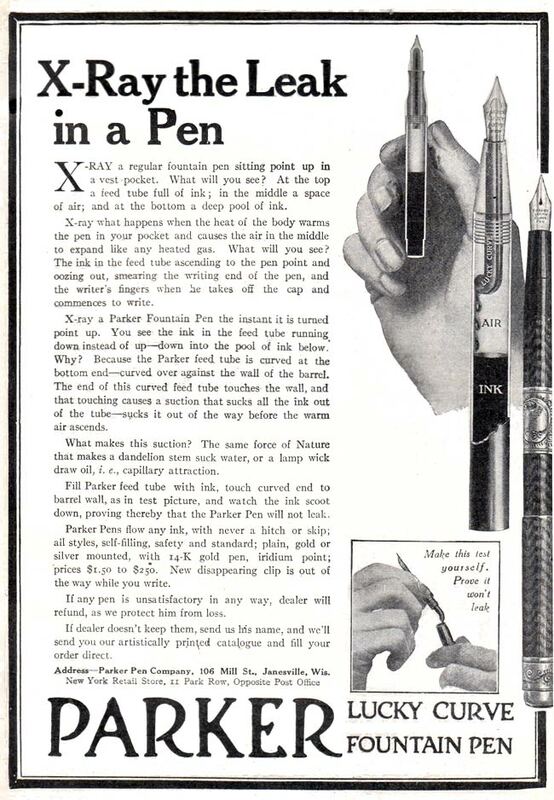 This very interesting ad shows off the Parker Lucky Curve fountain pen, designed with a feed tube that was curved to touch the barrel wall. Where other fountain pens didn’t have this, when they were placed nib up in a pocket, there was a space with air, and the pooled ink at the bottom. If all the ink wasn’t drained from the feed before the body heated up the air space, the air would expand, pushing the ink through the feed and out of the tip. We’ve all had this happen – open a pen and there’s ink in the cap – and we get ink smeared all over our fingers. The design of the curved feed of the Lucky Curve results in contact between the feed and the inside of the barrel wall, creating a suction that wicks the ink out of the feed before the body heats up the air. No more leaks! The best part? The pens ranged from $1.50 to $2.50, backed with a guarantee to refund you if you weren’t happy. This entry was posted in Vintage Pens and tagged Fountain Pens, Go Pens, GoPens, Parker, Vintage Fountain Pen, Vintage Fountain Pens, Vintage Pen, Vintage Pens. Bookmark the permalink. Follow any comments here with the RSS feed for this post. Post a comment or leave a trackback: Trackback URL.